Sauté World Bistro is a new Houston restaurant with an ambitious menu focused on international cuisine. Like many new restaurants, it is continuing to collect feedback from its patrons and updating/changing the menu as needed. 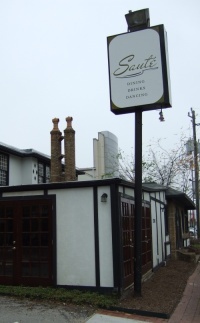 On December 16, 2008, the owners of Sauté Bistro invited Houston food bloggers to a “Food Blogger’s Invitational” private tasting event to showcase some of the dishes that are currently on the menu and some that are candidates for addition to the menu. The tasting would be provided free of charge (note that the owners did not ask for anything in return for the free dinner). Because the event was free, this is not a traditional restaurant review. I attended the event and this blog post represents my personal opinions and feedback about the dishes that were presented and about the restaurant as a whole. As with all new enterprises, there’s some good news, some bad news and some things that can be improved. I’ll start with some general comments about the restaurant itself and the restaurant business in general, then showcase a few dishes. 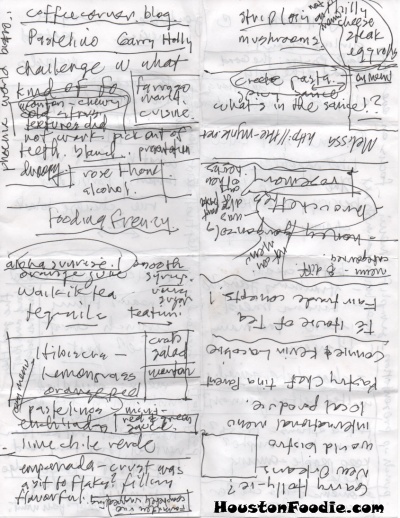 At the end I’ll provide my personal suggestions on some things that can be improved. The owners are experienced local business people, Connie and Kevin Lacobie, best known as proprietors of Té House of Tea on Fairview. Connie and Kevin are fantastic hosts and are obviously committed to making Sauté Bistro a success. They should be commended for having the bravery and confidence to invite a bunch of unruly food bloggers into their restaurant to dissect their menu! The chef, Garry Hollie, is a promising newcomer to the Houston restaurant scene. Recently arrived from New Orleans, Chef Hollie’s influence was seen (and tasted!) in some of the off-menu items we sampled. The location, on Richmond between Greenbriar and Kirby, is a well-known destination for Houston’s restaurant-goers. Located in the same block as Blue Fish House and the Hobbit Cafe, there is tremendous visibility in drive-by and foot traffic. Obviously, the economy. It’s a tough time to start a new restaurant. The location. What the restaurant gods giveth, they also taketh away. Countering the good news (above), this location offers a large number of choices for consumers spending their dining-out dollars. Many of the neighboring restaurants have been here for a long time and have loyal customers. It will be a challenge to get potential patrons coming to the neighborhood to bypass their usual hangouts and try something new. The concept. I’m deeply sceptical about the “world bistro” concept. Who is your potential demographic/audience? I can’t point to a nationally known, highly successful restaurant that has perfected this type of menu. Locally, there’s Farrago World Cuisine, but honestly I don’t know anyone who goes there for the food rather than the bar/brunch scene. However, it’s not an impossible concept, and it can be a way to distinguish Sauté Bistro from the other restaurants in the neighborhood. It will just take alot of tweaking and testing to get it just right. 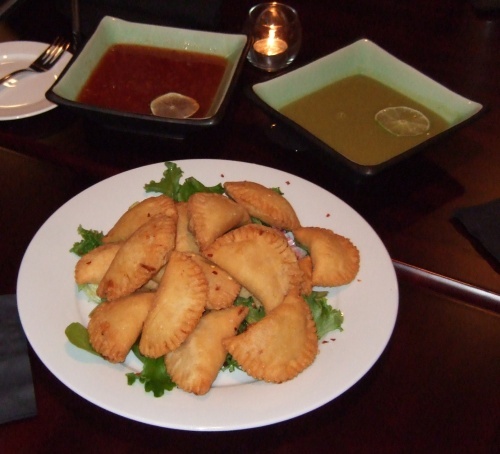 Spicy chicken pastelitos. True, I rarely meet an empanada I don’t like. But still these were skillfully prepared — crispy and crunchy on the outside, moist and flavorful on the inside. Mexican spice cake. Very nice combo of flavors and textures. The use of chili/spicy chocolate in a dish is a stroke of genius and a perfect representation of the international menu concept. The presentation was very nice also. The crab salad wonton. Regrettably, I found nothing to like in this dish. 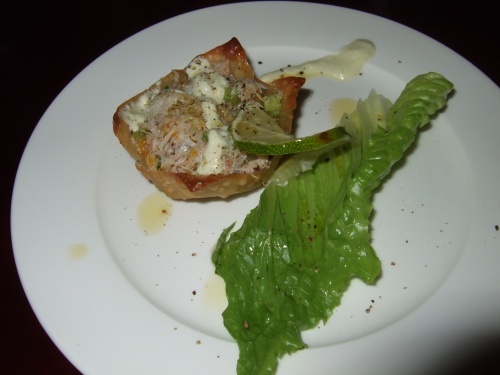 Generally underseasoned and bland, the flavor of the crab meat really had to stand out to make this dish work. It didn’t. The wonton was tough and chewy almost to the point of being inedible. The Romaine lettuce garnish is a big no-no in my opinion. The banana split cake. I greatly appreciate the ambitiousness of this dish. But there’s just too much going on flavor and texture-wise. It’s a bit of a muddle. At the very least you could remove the unnecessary cherry topping. Also the cake overall was too dense. I would have preferred a better contrast between the fluffiness/lightness/moistness of the banana bread and the density of the chocolate, strawberry(?) and vanilla fillings. As it was, the layers were all about the same density. Idea: Just serve a simple, moist, flavorful slice of banana bread with a big dollop of fresh cream and a garnish of banana slices or other fruit. Alligator Piccata. This dish was not on the menu (yet? ), and obviously represented the influence of Chef Hollie’s New Orleans background. I really liked the Alligator Piccata part of this dish. I thought the flavors were unique and intriguing. If you told me about this dish, I might think you were crazy, but somehow it works. A few comments about possibly rolling out this dish to customers. Reconsider the visual presentation. It’s gray, it’s brown, it’s black, it’s goopy and gloppy. I know that really shouldn’t matter, but we live in a world where some of the most sought after restaurant consultants work as “food stylists.” Appearance matters. Find some way to add some color (beyond parsley) or other visual appeal. The accompaniments need tweaking. 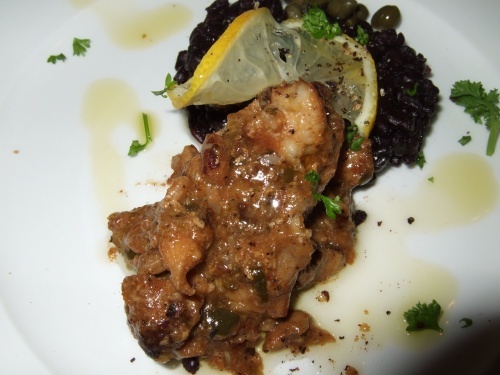 Although the bland neutrality of the forbidden rice offset the strong flavors of the alligator piccata, it really didn’t add much to the dish. Maybe some yellow (saffron?) rice to add a bit of additional flavor and visual appeal? Will customers visiting a “world bistro” be predisposed to ordering alligator? For instance, if someone is in the mood for cajun/creole/seafood and they head out to a cajun restaurant, they are “predisposed” to ordering alligator. I’m not so sure about a world bistro, especially when other choices include steak, chicken, and lamb chops. Tighten up the menu. 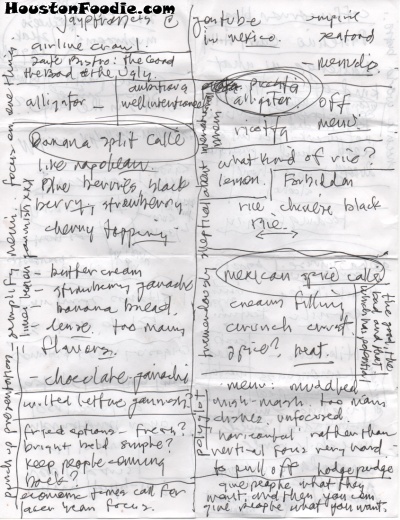 Currently the menu has eight — count’em, eight — sub-categories: Starters, Sides, Soup, Simple Delights(? 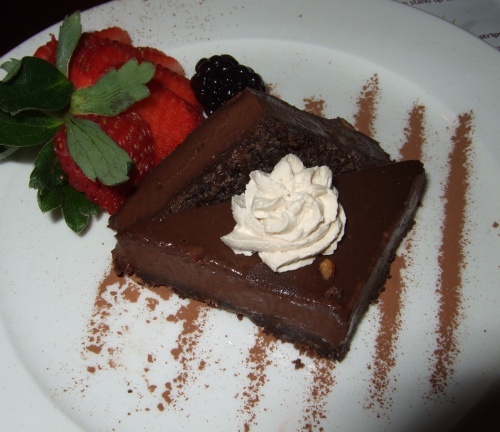 ), Salads, Vegetarian Affairs, Entrees and Desserts. You just need three: Starters, Entrees, and Desserts. No more than 8 starters, 6 entrees and 4 desserts (this also takes some pressure off the chef). Vegetarian dishes can be mixed in and noted. Daily specials can then be created to add more choice and diversity. On the back of the menu you can have sides and drinks (push the Teatinis!). Punch up the visual presentations. I’m not a big fan of semi-wilted lettuce as garnish. It seems old-fashioned. Keep garnishes simple, if you have any at all. For instance on the pastelitos, instead of sitting on a platter in a bed of lettuce, have them stacked upright like soldiers in a simple round bowl lined with white butcher paper (where’s a food stylist when you need them?). Same with the thin-sliced, wagon-wheel citrus garnish placed on top of dishes. I realize it is meant to convey to the diner that there is citrus in the dish but it still seems old-fashioned. Some alternatives to achieve the same effect: use a microplane to add a light dusting of lemon zest on or around the edges of the dish. Or just a shapely lemon twist. Find a signature dish. 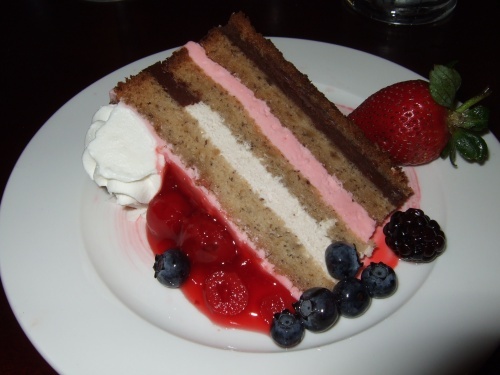 Find a dish that will cause people to say, “I’ve got to go back to Sauté Bistro for that ______ dish!” The spice cake is a good candidate, but people aren’t going to come just for the dessert. Empanadas are a possibility. The alligator is also a possibility if you can make it work with the overall concept. I greatly enjoyed the “Food Bloggers Invitational” at Sauté World Bistro for many reasons. Meeting Connie, Kevin, and Chef Hollie. The camraderie of other food bloggers. The ambitious tasting menu. Some things worked, some didn’t. But with continued testing, feedback and updating, Sauté has the potential to be a successful addition to the Houston restaurant scene. This entry was posted in Blog Only, Food, Restaurant Reviews and tagged empanada, food bloggers, saute bistro, te house of tea, wonton. Bookmark the permalink. Good comments! It was really nice to meet you. I finally wrote up my thoughts–I tried not to read anyone else’s but I think we all left feeling kind of the same way. Thanks for the report. I didn’t get to go (had to work that night) and the place intrigues me. My husband and I eat at Hobbit Cafe semi-regularly, and the concept sounds interesting. Any idea on prices? I think that will be a huge issue in this economy, especially if oil doesn’t go back up any time soon. Megan – if you click through to their website from the link in the post they have a menu w/prices available on their website. Moderate prices I’d say. Thanks for the feedback! We’re definitely listening, and thinking about how best to move forward with our restaurant. I should remark, first and foremost we wanted to create a fun event – I am a blogger myself, very much involved in the social media world, and I’ve met many of the food bloggers separately; each and everyone I’ve met was so much fun, I thought it would be great to get everyone together. Of course, we also wanted to get some feedback – from yes, the harshest of critics – the food critic! We enjoyed the event, and hope everyone else did too. Thanks again to you and Connie for the event. Yes, everyone did have a great time. And I will be back in the future–as a guest and not as a blogger!